Gruesome? Not likely, just white chocolate balls of fun! A perfect Halloween recipe for scary parties. MAKE the jelly as per packet directions and pour into a shallow dish to set. STIR together the PHILLY and OREO in a bowl to combine. Roll mixture into walnut sized balls, place on a paper lined tray and refrigerate until firm. FOR the first coating of chocolate, melt 2/3 of the white chocolate in a bowl over very gently simmering water. Remove from the heat, add the remaining chocolate and stir until smooth. Dip the balls into the chocolate and allow excess to run off. Place onto a paper lined tray to set. REPEAT this process with the extra white chocolate to produce a second coating. PIPE a small circle of coloured icing on the top of each truffle to resemble an iris, then add a chocolate chip for the pupil. Repeat with the remaining truffles. Store in an airtight container, refrigerated, until required. USE a fork to break up the jelly and then transfer to a serving plate. 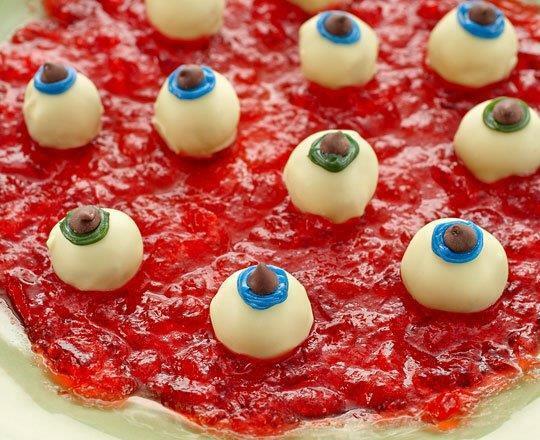 Arrange the eyeballs on the jelly and serve immediately.